Each field of endeavor is distinguished by just a handful of contributors that shape and direct the course of their profession. These men are usually relatively unknown to the lay public. The pressure of their influence is most direct and distinct within their own specialty: their prominence is strongest among fellow artisans. 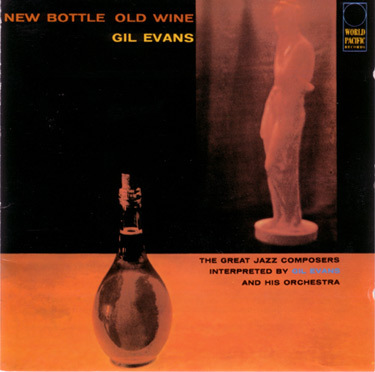 For more than a decade Gil Evans has been one of these men; within the highly specialized field of composition and arranging he is one of today's half-dozen or so most significant and influential individuals. Evans has in addition achieved a high level of acceptance beyond the in group - the appeal of his music reaches far beyond the jazz-oriented sphere and touches upon the ears of nearly all those in any way musically inclined. Quality winning hands down over quantity, Gil Evans output has remained relatively meager in recent years. The struggle has not been in seeking outlets for his work (the main channels have been open to him for many years), but in maintaining a high degree of creative worth within an appealing and worthwhile framework. The Evans ability to express the works of others in a highly complimentary way, at the same time maintaining a character that is individually his, is evidence of his expansive musical strength. This album, which represents works from earlier eras in a contemporary big-band framework, presents writing by major jazz composers and influential jazz players. The tunes are arranged chronologically, and the album's general continuity is maintained by Evans' use of transitional material to link the tracks. World-Pacific is pleased to present one of Amenca's greatest composer-arrangers in this unique showcase. Opening suitably with the blues, Cannonball leads the band into a shouting St. Louis Blues, which is comfortably noodled out by Gil and Chuck Wayne, leading into the infrequently-heard verse of Kin~ Porter Stomp, taken from the original jelly Roll Morton version. Cannonball and the band build to more Evans noodling, which leads to Willow Tree, a not-too-well-known Fats WaIler tune from the Broadway show "Keep Shufflin'," Gil's use of ever shifting textures serves to constantlv refocus attention on Fats' line; the short trumpet solo by John Coles, with Gil and the band leading out. Drums and John Barber's tuba scoot into Struttin' With Some Barbeque, with the door opening up into the band. Frank Rehak's trombone is joined by the band, followed by soaring Adderly; Gil's lick takes Cannonball out against a tuba pedal. The album was recorded in four sessions, held on April 9 and May 2.21, and 26 in New York City. Basic personnel consisted of Ernie Royal, Lou Mucci, and Johnny Coles on trumpets; trombonists Joe Bennett, Frank Rehak, and Tommy Mitchell (bass trombone); Harvey Phillips on tuba, Julius Watkins, French horn, Gerald Sanfino playing bass clarinet, piccolo, and flute; rhythm was Chuck Wayne, guitar, Paul Chambers, bass, and Art Blakey, drums, with Gil himself on piano~ Julian "Cannonball" Adderley, alto, was principal soloist~ Philly Joe Jones replaces Blakey on Willow Tree, with Phil Bodner in for Gerald Sanfino and John Barber for Harvey Phillips on Willow Tree, Struttin With Some Barbeque, Manteca, and Bird Feathers; Clyde Reasinger replaces Ernie Royal on the last three. Editing was by George Avakian and Evans, with final remastering by Richard Bock and Woody Woodward. A brief musical history of Gil Evans would cover his self-teaching as a musician, the formation of his own orchestra in Stockton, California (the band later worked Balboa's Rendezvous Ballroom); the band, under Skinnay Ennis, moved to the Bob Hope show, with Gil remaining as arranger. Gil joined the Claude Thornhill band in 1941, returning after a stay with the arm in 1946, remaining until 1948. Freelancing in New York, he served as personal arranger for Billy Butterfield, Pearl Bailey, Polly Bergen, Miles Davis, Tony Bennett, Benny Goodman, Gerry Mulligan, Helen Merrill, Peggy Lee, and several others. His arrangements and compositions long ago estab lished him in the front rank of contemporary writers. Cannonball Adderley, the album's principal soloist, arrived on New York's jazz scene with a remarkable flurry some four years ago from Florida, and the excitement generated initially by his presence has not yet abated. His vigorous and forceful approach to the alto serves both to support his own dextrous solos and as an excellent voice for Evans' thinking. Gil again: ..... It was a pleasure to make, the musicianship left nothing to be desired and every body connected with the making of this album seemed to have a ball doing it." We think you'll feel that way too.